The current KEMAR Head and Torso has the same dimensions and acoustical properties as the original KEMAR, but has been developed further by GRAS to meet the industry’s demand for realistic measurements of hearing aids, headphones and headsets. It provides acoustic diffraction similar to that encountered around the median human head and torso, both in the proximity and in the far field. 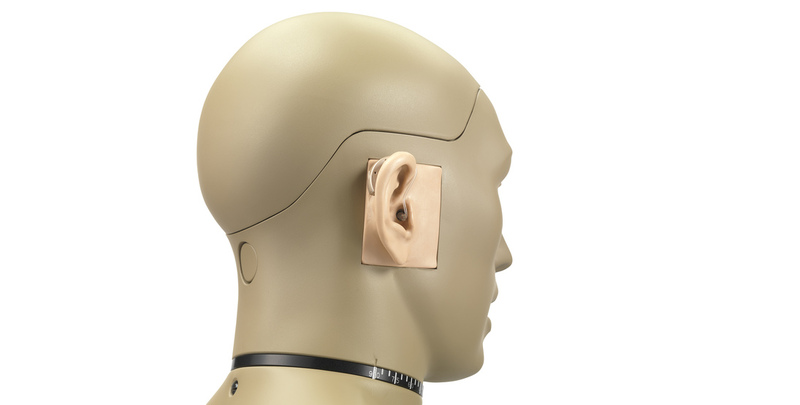 The 45BB-2 is a KEMAR head and torso for 1-channel hearing-aid test, with prepolarized ear simulator and large 55 Shore OO pinnae. The main configuration specific components of the 45BB-2 are the GRAS RA0045-S1 Ear Simulator According to 60318-4 and the KB0065/KB0066 large pinnae. The acoustic input impedance of the RA0045-S1 Ear Simulator closely resembles that of the human ear and, as a result, loads a sound source in very much the same way. Read more about RA0045-S1 here. Even though 45BB-2 is configured for single-channel testing, both pinnae must be used to obtain correct diffraction around the head.